Young Samuel Collier is an orphan with an attitude and no place to go. When he's arrested for stealing a locket that had once belonged to his mother, Samuel is put to work as a page for Captain John Smith who is bound for the New World. At first, Samuel is determined to live life as an island, to keep everyone out and stand alone. But soon Captain Smith helps him to realize that one cannot survive alone in the New World. It will take the entire James Town colony working together in order to survive. The problem is that the gentlemen in the colony, sent by the Virginia Company to look for gold or any other profit they can find, don't see things that way. They are determined to let the commoners do the work and hog all the rations, living much as they were accustomed to back in England. 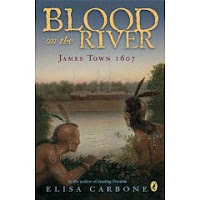 A meticulously researched historical novel, Blood on the River really takes you back to 1607, to the sights, sounds, and smells of Jamestown. Although it was a bit slow at first, once the colonists got to America and began interacting with the local Indian tribes, I found it fascinating. I especially liked the details Carbone included about the natives' appearance and traditions and the reasons behind them. The looked like "savages" to the English gentlemen, but that's because they were totally different and the Englishmen didn't understand the reasons for what the Indians wore or how they cut their hair. The details were very rich and the story is rife with adventure. There's a sea voyage, fighting with the natives, hunting, and sword fighting. There's a fair share of violence (people getting hit with arrows, dying of illnesses, burning down houses), but it was a violent time. Reading Carbone's copious author's note, I learned that all the main characters in the story were real people. The events in the story are based on actual events. This won't be a book for everyone, but it would make an excellent companion novel to any kind of study about Jamestown or Virginian Native Americans. I think young history buffs could also get into it, too. It's not a novel to be breezed through, but one to savor so you can soak up all those rich details that the author paid so much attention to. I've said it before and I'm sure I'll say it again, but this is a book I never would have picked up on my own. And I've got to send a big shout-out to the wonderful Illinoisans on the Caudill committee...! this is good for a summary for school......hahaha.....but i reword it!!! i read this for school and im really glad i did cause it was my favorite book we had to read all year. extremely detailed. and very accurate. fun to read. characters are very likeable too. i really enjoyed it. i aloso had to read it and it was okay but to me, it was kind of confusing like they will be talking aabout one thing then, completely something else pops up. I am only on page 35 ,but love this book already!!!!!! this book is the best i have read in my whole live!!!!!!!!!!!! itis awsome and Elisa Carbone is a very accurete writer i loved her book!! This summary is great. I used this for my students. there is note enough information of why people agreed or disagreed about how this book was good or bad.